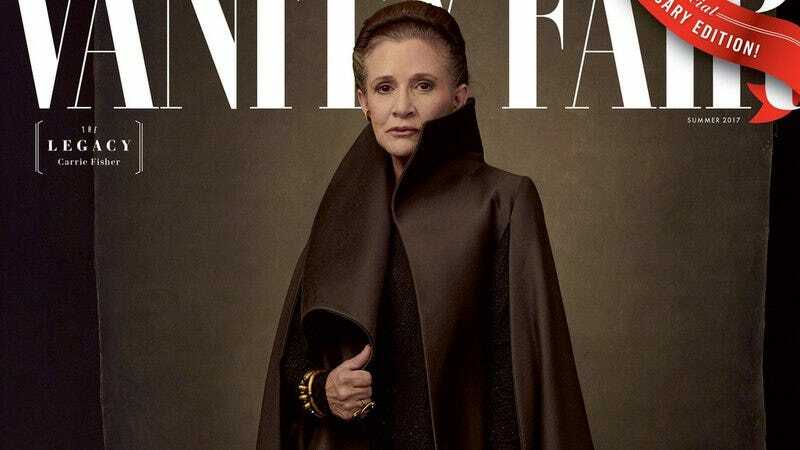 Vanity Fair has unveiled a series of covers this morning shot by Annie Leibovitz and dedicated to the cast of The Last Jedi. The poses are familiar—Daisy Ridley and Mark Hamill gaze into the distance as Rey and Luke; Gwendoline Christie, Adam Driver, and Domhnall Gleeson make a villainous trio—but most striking of them all is the solo portrait of Carrie Fisher, who stares down the camera in an image that manages to be both powerful and wistful. A fourth cover also introduces one of the franchise’s new members, as Kelly Marie Tran’s Rose Tico grins beside Oscar Isaac as Poe Dameron and John Boyega’s Finn. During the Star Wars Celebration last month, director Rian Johnson revealed that Rose is a Resistance maintenance worker. A full story story from VF is due online tomorrow.